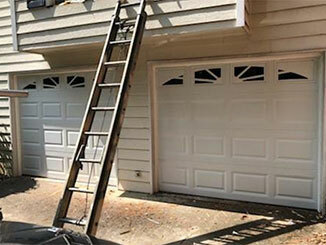 It is generally recommended that you have a professional examine your automatic garage door once every six to twelve months to catch any problems before they become serious. In the meantime, there are warning signs you can look for yourself, which will let you know your unit needs work. Here is a short list of things you should pay attention to if you want to keep your garage door working smoothly and prevent hardships down the line. When your door is open, you can check the tracks and grooves for rust, especially if your door isn’t weather-sealed and protected against moisture. You should also look at the springs and cables for signs of rust, but don’t touch them yourself, especially while they’re in operation. If you see rust, you should get this treated as soon as possible, and lubricate and insulate your door carefully in the future to prevent the rust and corrosion from reoccurring. If there is a problem with your opener or springs, your door might rise and fall unevenly, or with a jerky, unsteady motion. This can also be caused by rust or warping along the tracks, or by a problem with the connections between the door panels themselves. Don’t wait for a small problem to get worse; if there’s something off about how your door when it is opening and closing, you should call a professional to treat the problem when you notice it. Most optical sensors have a set of LED lights that blink on and off or change colors when the sensors slip out of alignment. Check the manufacturer of your sensors, and make sure you know what it looks like when your sensors are telling you there’s a problem. If they don’t have a warning system, you might want to consider investing in a more modern set from a better manufacturer. The first sign of trouble with an automatic door is usually the sounds it makes. If the machinery is getting louder, or if you hear grinding while the door is opening or closing, this can be a sign that something needs attention. Perhaps the motor gear is going in the opener or your tracks have become misaligned. Don’t wait for things to get worse, call our professionals at Garage Door Repair Cedar Park to diagnose the problem as soon as you notice something amiss.